There might be many more legends about Sarimanok. Sultan is a noble title with several historical meanings. Originally, it was an Arabic language abstract noun meaning “strength”, “authority”, “rulership” and “dictatorship”, derived from the masdar سلطة sulṭah, meaning “authority” or “power”. Later, it came to be used as the title of certain rulers who claimed almost full sovereignty in practical terms (i.e., the lack of dependence on any higher ruler), without claiming the overall caliphate, or to refer to a powerful governor of a province within the caliphate. The dynasty and lands ruled by a sultan are referred to as a sultanate. Mecca, also transliterated as Makkah, is a city in the Hejaz and the capital of Makkah Province in Saudi Arabia. The city is located 70 km (43 mi) inland from Jeddah in a narrow valley at a height of 277 m (909 ft) above sea level. Its resident population in 2012 was roughly 2 million, although visitors more than triple this number every year during Hajj period held in the twelfth Muslim lunar month of Dhu al-Hijjah. As the birthplace of Muhammad and a site of Muhammad’s first revelation of the Quran (the site in specificity being a cave 3.2 km (2 mi) from Mecca), Mecca is regarded as the holiest city in the religion of Islam and a pilgrimage to it known as the Hajj is obligatory for all able Muslims. the other, unseen, became the apo of the spirits that Maranaos invoke in a number of rites and rituals. These two brothers made an agreement, each one to protect each other from malevolent spirits that may cause illness or even death. As a sign of goodwill, the itotoro, totem bird, which happens to be a rooster, is taken cared of by the seen (Maranaos), as a link to the unseen spirits, their ancestor. Henceforth, the totem bird became the link between the seen and unseen. The Maranao legend says of a sultan’s daughter being swept by a colorful rooster that turned to a dashing, handsome young man and the two was never seen ever again. The sultan then created visual replicas of the bird so that she can remember her daughter through it. Maybe he finds it easier to remember the chicken, rather than her daughter. After the arrival of Islam, the creature came to represent the giant cockerel that, according to tradition, Prophet Muhammad encountered in the first of the Seven Heavens. Maranao also spelled as Meranao and Maranaw, is the term used officially by the Philippine government in reference to the southern tribe who are now the people of the lake called Ranao in the Iranaon language, a predominantly Muslim region in the Philippines island of Mindanao. They are famous for their artwork, sophisticated weaving, wood and metal crafts, and their epic literature. The word Maranao, also spelled Maranaw is a misnomer as it does not have a sense in reference to nouns such as people, place or thing. The prefix MA- means ‘to be’, i.e., Maranao means to be lake. The real term is Iranon which when pronounced fluently is Iranon (also Iranun) meaning “People of the Lake,” referring to the indigenous people who inhabited the lands around Lake Lanao whose principal town is Marawi City. The Maranaos are part of the wider Moro ethnic group, who constitute the sixth largest Filipino ethnic group. The life of the Maranaos is centered on Lake Lanao, the largest in Mindanao, and the second largest and deepest lake in the Philippines. This breathtakingly beautiful lake is surrounded with myths and legends. A commanding view of the lake is offered by Marawi City, the provincial capital. The ancient people in Mainland Mindanao were called Iranun, also spelled Iranon, of the coastal area of Illana Bay (Ilian in Maranao) and Iranaon of the people in Bembaran or Bukidnon and Kiaranda Area, a ragat or ranao, a lake, in local language. The Iranon is the people of the constant flow of rivers and creeks from the mountains to the coastal areas. A volcanic eruption developed a flat land surface little-by-little. In modern science describes and illustrates this process as results of sedimentary formation and residual remains that forms the low and flat land surface in the coastal areas. The Maranao vernacular called it “ira” which means remains. Thus, the name of the people in the coastal area of Illana Bay was derived from the root word “ira” plus “ranao” forms the word Iranaon which means people living the residual remains in the coastal areas. In present days, the Maranao refers the word Iranaon “tao sa ragat” or the people of Lanao who migrated to sea area [others believed that the word Maranao is a combination of two words “Malay” and “Lanao” or the Ancient Lake Lanao thus making it “Maranao” that mean People living around lake [lanao] while the Maranaos are people who dwelled around the lake of Lanao. These peoples belong to same genealogy, lineages, culture and history. They are called Maranao in general term. The Sarimanok is a legendary bird of the Maranao people who originate from Mindanao, a major island in the Philippines. It comes from the words “sari” and “manok.” “Sari” means cloth or garment, which is generally of assorted colors. Manòk is a Philippine word for chicken. It is the legendary bird that has become a ubiquitous symbol of Maranao art. It is depicted as a fowl with colorful wings and feathered tail, holding a fish on its beak or talons. The head is profusely decorated with scroll, leaf, and spiral motifs. It is said to be a symbol of good fortune. 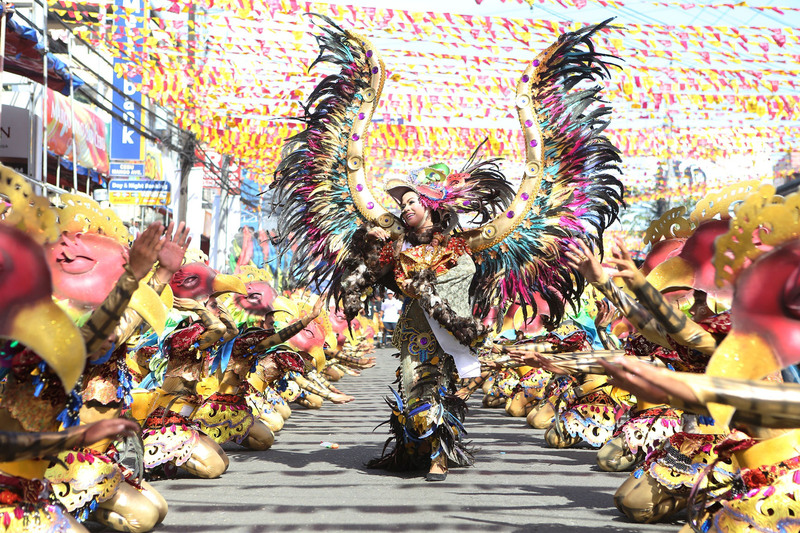 The Sarimanok is also believed to have originated from an Islamic legend. According to the legend, Muhammad found a rooster in the first of the seven heavens. The bird was so large its crest touched the second heaven. Its crow roused every living creature except man. Judgement day would come once this celestial rooster ceased to crow. A Maranao legend also says of a Sultan’s daughter being swept by a colorful rooster that became a handsome young man and they were never seen ever again. The Sultan then created replicas of the bird to remember his daughter by. According to the tradition, the sarimanok is never displayed by itself. It must be displayed with the set of flags, standards and vexilloids. At present, this is not totally true; sarimanok may be placed on the top of the umbrella of a Sultan or dignitary, and also, the Mindanao State University has adopted it for the graduation exercises following a non-traditional use. The Far Eastern University seal bears the FEU Coat of Arms and the sarimanok motif. The FEU Coat of arms consists of eight-pointed golden star that represents the first eight main disciplines of FEU. The sarimanok is a legendary bird in full color that project the nationalistic spirit upon which the university is founded. The university wanted to have a Filipino touch in everything because they were one of the first universities in the Philippines to be founded by a pure-blooded Filipino, Dr. Nicanor Reyes, Sr..
Why is the Sarimanok on top of the Dolang? The Sarimanok as an art symbolizes the totem bird, itotoro, considered a twin-spirit called inikadowa of the Maranaos. According to this belief, every Maranao born has his own twinspirit. 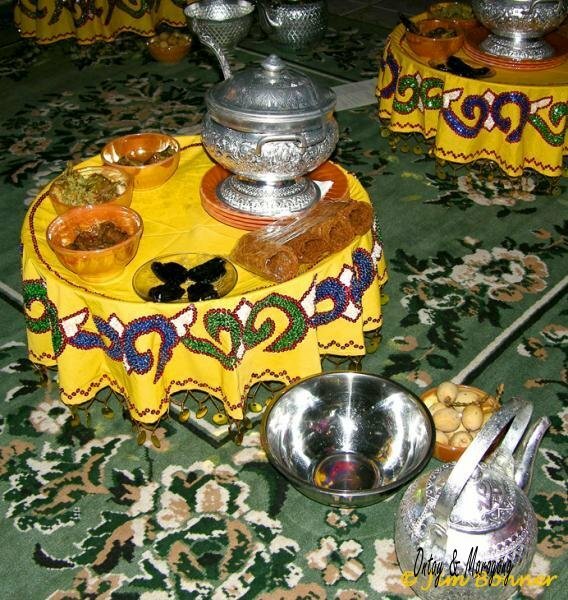 In the ritual stage, food is served to the lamin, a four-square cubicle wrapped in yellow cloth, hung at the ceiling of the house, believed to be the abode of the spirits. 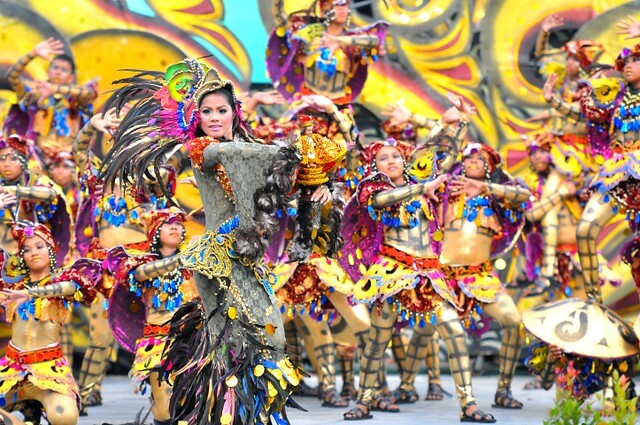 As an art form, the fish on the beak of the carved Sarimanok symbolizes the food that is offered to the totem bird, which is now transformed into an art form, the Sarimanok. In the dolang, the food in the tabak represent the food offering to the Sarimanok, the latter transformed into a cake in the shape/mold of the bird, Sarimanok. Thus, the Sarimanok (in cake form) is on top of the dolang, brass tray. In a one-tier dolang, the yellow rice is shaped like a mound and is decorated with boiled eggs placed on sticks around the plate. The same symbolism applies for the egg which represents the bird, Sarimanok; the rice represents the food offering to the bird, the bird as represented by the egg. In other words, almost all the rites and rituals that Maranaos do can be traced to their myths and legends as the ultimate source. It explains why they have to reenact such activities in their life cycle because they believe such events took place in the past. These legends and myths are “real” in that they justify such rituals. Good harvest means the spirits invoked during the kashawing were satisfied. In like manner, poor harvest means they were not pleased. Likewise, the ritual performed in kaganat sa lantai (child baptism) is also traced to Apo Babowa, the Spirit of Mothers. My first encounter with this legendary bird wasn’t very overwhelming. The Sarimanok appears on the station ID of a local TV station in the Philippines back in the late 90’s which one can probably see at least twice a day. It became just a nice bird with lots of colors. It doesn’t seem very special, and it looks like a rooster. It means wealth and prosperity to the Maranaos. Tracing its roots to Islam due to the involvement of Muhammad in this, it is of no surprise that its popularity is widely accepted in the southern parts of the country. The Maranao legend says of a sultan’s daughter being swept by a colorful rooster that turned to a dashing, handsome young man and the two was never seen ever again. The sultan then created visual replicas of the bird so that she can remember her daughter through it. Maybe he finds it easier to remember the chicken, rather than her daughter. It is surprising that we Filipinos have a legendary bird too, just like the Phoenix. It is through the nature of its appearance that it probably got its name. Sari means cloth or garment, which is generally full of colors and Manok (you should go back to being a baby if you’re Filipino and don’t know what manok is). The Sarimanok is a colorful chicken indeed. Sarimanoks are excellent examples of how pre-Islamic traditions were Islamicised in order to be better accepted. The creature seems to derive from a totemic bird of good fortune called Itotoro that was already a symbol of the Maranao people from Mindanao Island. After the arrival of Islam, the creature came to represent the giant cockerel that, according to tradition, Prophet Muhammad encountered in the first of the Seven Heavens. Like this extraordinary sculpture, sarimanoks are normally portrayed flying and carrying a fish in their talons, two characteristics that cannot be associated with cockerels. Set of eight gongs made of bronze, on a wooden stand in the shape of a Sarimanok (mythical bird, divine messenger). Accompanied by one larger gong (here made of iron, but usually also made of bronze) and two drums. The eight small gongs differ in pitch but the height of the tone is not fixed and can differ per set. The number of large gongs can vary from one to several gongs of different pitch and size. The small gongs are struck with two sticks of appr. 30 cm. length and made of a soft kind of wood, probably of the papaya tree. The large gong is struck with a special beater. The conical drum is struck with a thin piece of bamboo of appr. 40 c.m. length. The cylindrical drum is struck with either the hands or two short wooden sticks. To indicate the dimensions of the whole set, the length of the Sarimanok-shaped stand is 2,60 mtr, from head to tail. For other dimensions, see the pages of the other instruments of the ensemble (see above). The drums, the stand and the frame are all quite roughly made but elaborately decorated with colourfully painted wood carvings, called ‘okiran’.